Dreamworks has released a clever new poster for Megamind, which satirizes the iconic Hope poster that was instrumental in communicating Barack Obama's platform ideals in the 2008 Presidential Election. 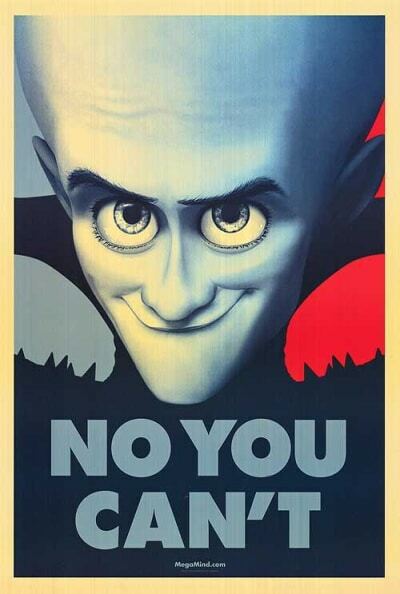 Instead of the message of hope, the response "No You Can't" resides under Megamind's ugly mug, directly defying Obama's slogan campaign of "Yes We Can." Megamind features the voice talents of Will Ferrell, Brad Pitt, Tina Fey and David Cross and opens in theaters everywhere in 2-D and 3-D on November 5, 2010. Check out the new poster below, and see all of our Megamind pictures in the gallery!